Are you prepared for a dose of adorable? Sonia Doneghue here from Ms. Ruin's Playthings with my first project for 2014. Baby photos are so much fun to work with and our family was recently blessed with a baby girl...just in time to play with the new Bo Bunny line, Baby Bump! 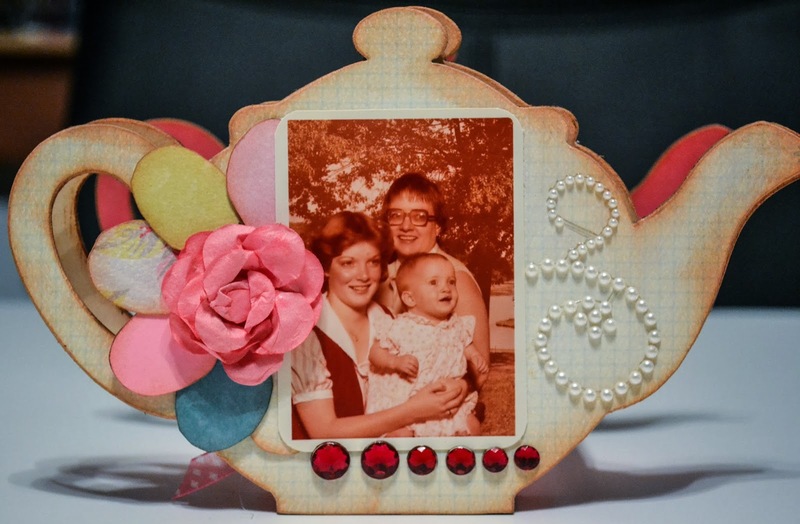 Keep in mind that you can find all of the products used in this project at The Crafty Scrapper and if you have any questions, leave me a comment or call up the store at 972-923-3151 and a friendly crafty person will assist you. A little bit about the cover --there's a lot of Maya Road going on here, I can't help myself to their embellishments and chipboard albums! But what I really want to point out is the doily paper with the banner and black bird. All of those elements are actually one single piece of scrapbook paper. I simply cut a slit behind the bird and banner so that I could slide the picture between the banners/bird and the doily. This gives the effect of multiple layers. You will see that I make good use of a lot of the paper in my project. 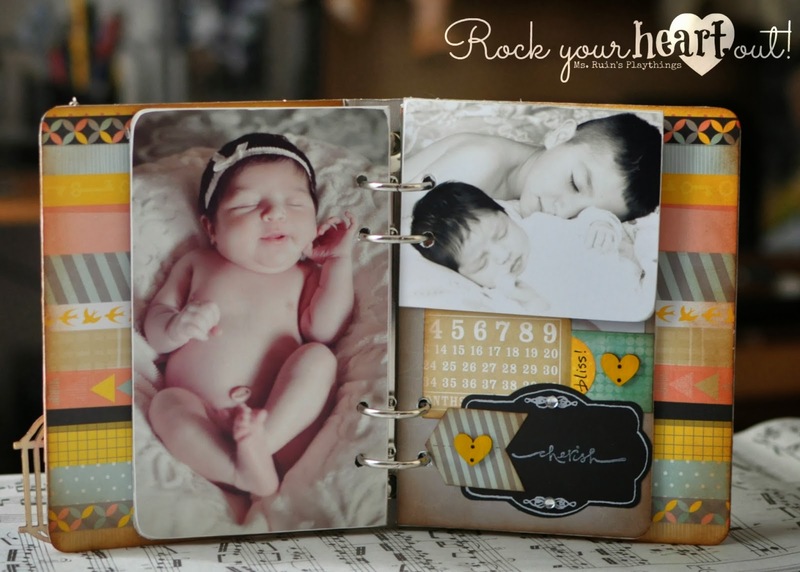 The fun thing about these chipboard albums is that you have the freedom to add cards, pockets, etc., that will be held in place by the rings. I didn't add anything to this book, however, I did take one of the pieces of chipboard and cut it in half. I then put pictures on both sides and was able to add a little flair to the flow of the book. In the photo above you see the picture of my napping nephew and niece with embellishments below. 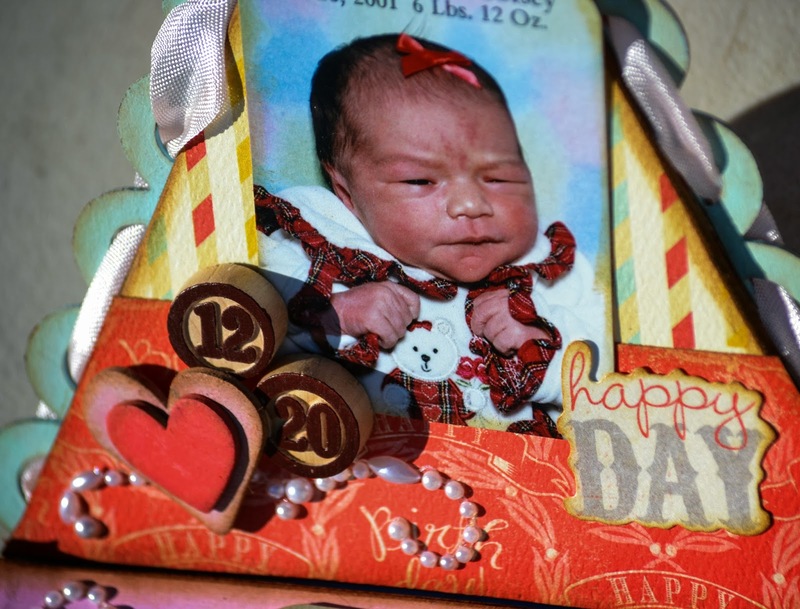 But when you turn that one piece of chipboard over, you have another photo of the two that continues the the theme of brotherly/sisterly love. A little special touch if I do say so myself. I mentioned earlier that I make good use of my paper. Here is a perfect and adorable example of that. This frame, as well as all other paper embellishments, are part of the Bo Bunny Baby Bump line available now at The Crafty Scrapper. I simply cut out the center of the frame and adhered a photo behind it. Then I added twine and hardware to make it appear as if it was hanging from a wall. I think the Prima flowers escalated the character that this page was already emanating. Don't you? I hope you enjoyed my first project for 2014. Again, if you have any questions about the project or would like to take a more in depth look at this book, hop on over to my blog for extended details. 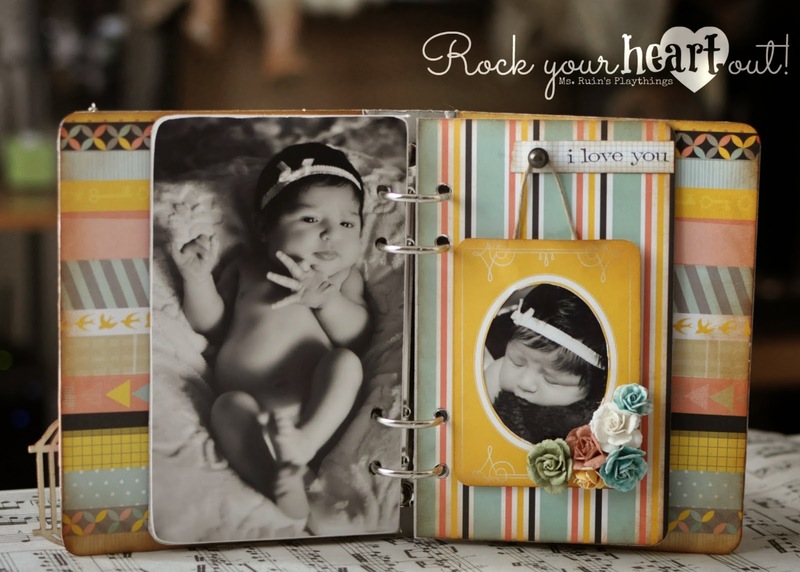 And don't forget that you can stop by the store and view the book as you pick up your Baby Bump paper and all of the sweet embellishments used to make this mini book. Peace, love, and Oh baby! to share a project with you! many of my EXISTING supplies complimented the Authentique line. I was a bit on the fence as to whether or not to pick up the vintage frame die (leaves are a no brainer, they go on EVERYTHING) --- however with the finished project, the picture I used was a bit bigger than the frame - no worries -- I just cut the frame to stick out the sides of the picture as if I was being quirky and meant to have the frame BEHIND the picture !! I tried and tried and tried to capture the details on this FAB flower -- it turned out SOOO much better than I imagined. 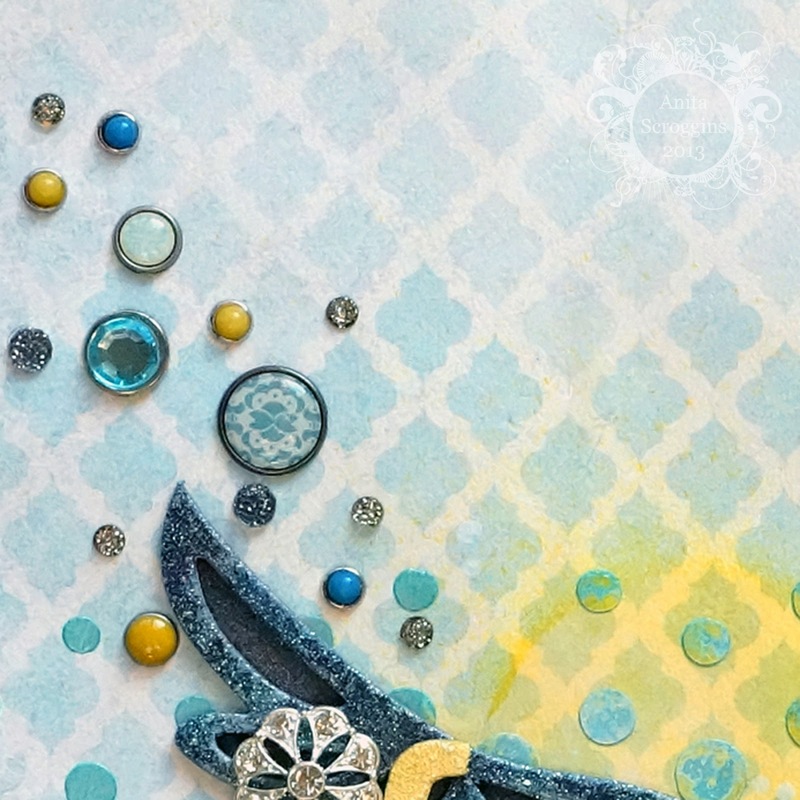 I love Maya Road's Iridescent Pearl spray - it is just the right amount of glimmer to anything.. fabric, paper, you name it! Then I traced along the edges of Maya's burlap rose with Icicle Stickles ... it seriously transformed the flower -- grab a look see at the store. For the Tim Holtz Leaf die, I used teh fun flower paper, traced the edges with a paint pin and spritzed it with the Iridescent Pearl spray. For the frame, I just used the Authentique solid pink paper, stamped with a handwriting stamp, then rubbed the distress ink around the edges for depth. The frame is cereal chipboard with Authentique paper and hand writing stamp. The flowers are a crepe paper material and available at the store - adding the infamous Iridescent Spray added SO much! Thanks for looking and let me know if you try anything outside your comfort zone.... I am glad I did. Hello friends! It's Gena here with a layout to share with you. I believe this is going to be one of my favorite layouts I have created. I LOVE the subject matter, my sweet granddaughter, Autumn, but it is really just the sweet simplicity of it all that makes me smile. I used the Authentique Classique: Elegant paper collection. I used pearl bling and the beautiful mini sparkle and shine resin flowers by Maya Road. 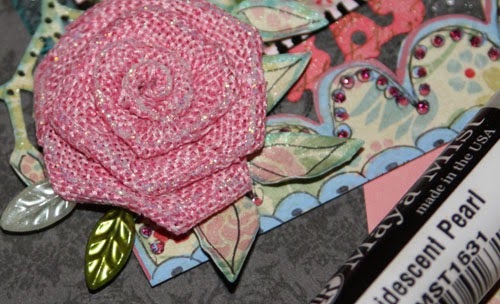 I am also in love with my punch borders! The simple Antique pearl center flower by Maya Road was just the right touch on top of the lace paper doily. For the title I used my Maya Road letters, painted them black and added glossy accents. Hi everyone! It's Gena and I just wanted to send a big THANK you to all the vendors and everyone who came out and participated in The Crafty Scrapper garage sale! The line started forming about 4:15 and everyone was READY to SHOP!! Here are a few pictures of some of the items that were for sale... stamps, tools, albums, paper. 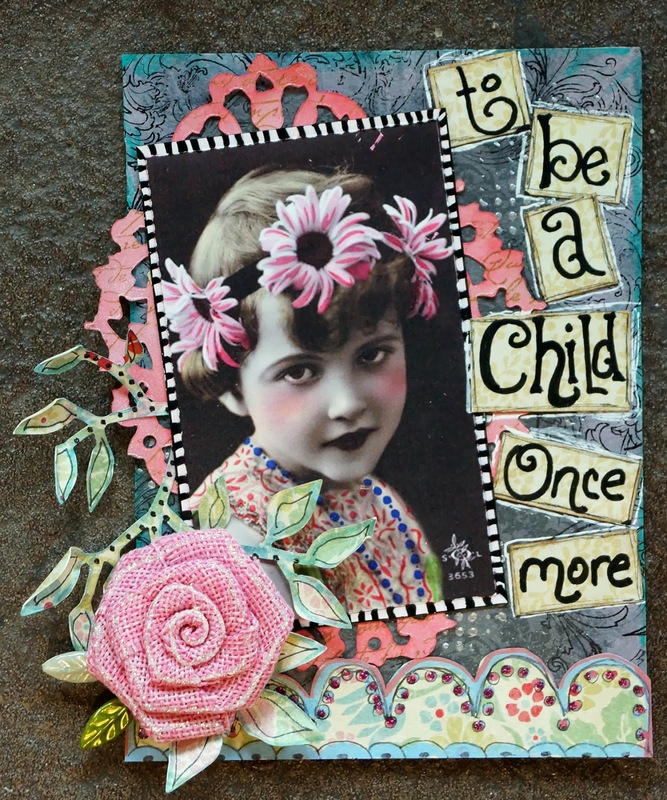 embellishments, altered items and SO much more. If you missed this time... don't worry! Just be watching for the next one! Have a great day! Hope to see you soon at The Crafty Scrapper!! Hi blogging friends! It's Amy here today with a mini book to share! When I received this paper in one of my design team kits, though the colors were bright, the collection screamed vintage project for me. This sent me rooting around for the small collection of photos I have from my childhood. Tea cups have been collected in my family for many generations. That particular fetish missed me, but I can't see a teapot or teacup without remembering those who came before me who treasured them. 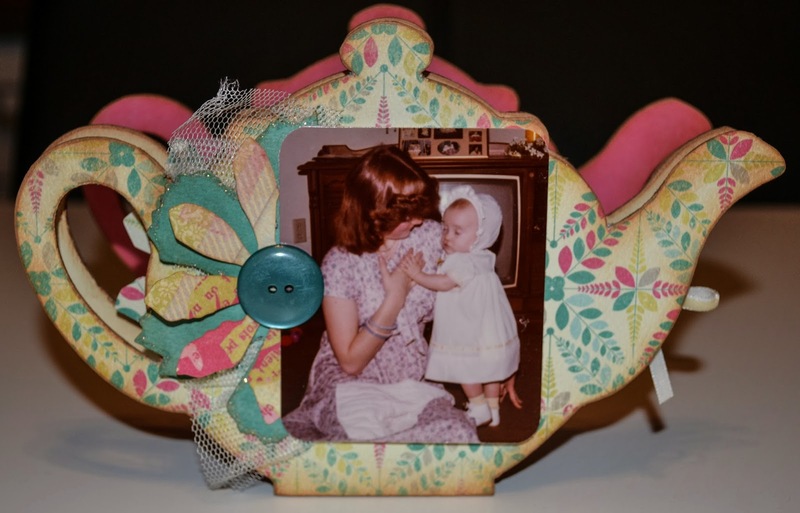 When I knew I was going vintage photos with this project the Maya Road Tea Pot mini album was a sock and shoe kind of decision. Lots of Maya Road goodness happening here. I sprayed the letters with Maya Mist and then covered them in Stickles and Crackle accents. 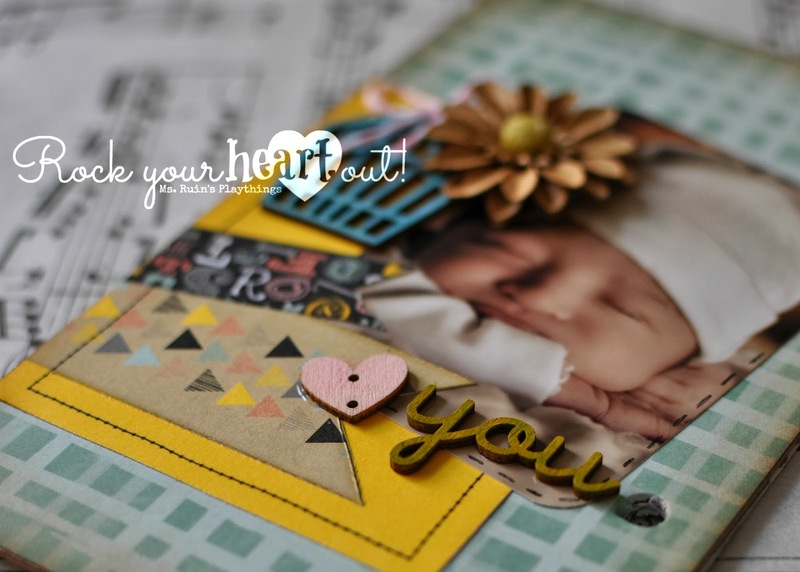 The paper collection I used on the entire project is Authentique's Flourish collection. The larger leaves on the flowers were made with the cutouts of the tea pot handle when I originally covered the pots. Save your scraps, it's interesting the number of times I find a use for them in a project! 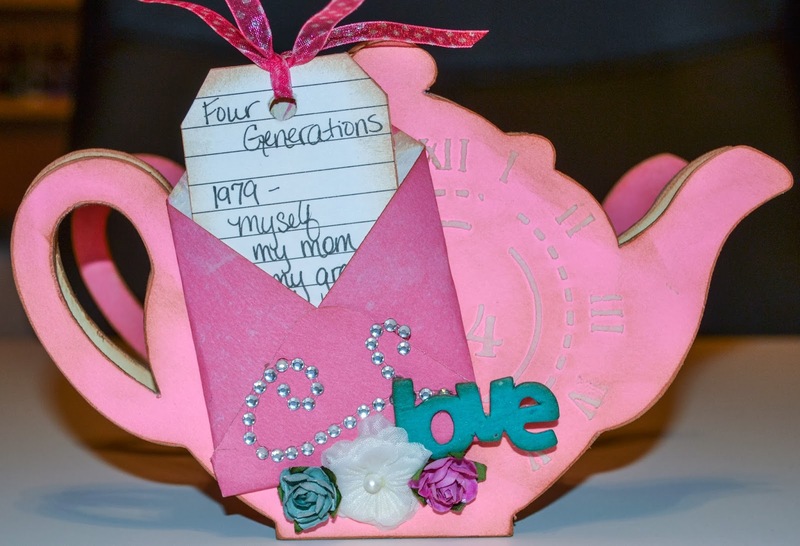 I used my Vagabond to cut out the flower shapes here out of the scraps I had once I had covered the tea pots. 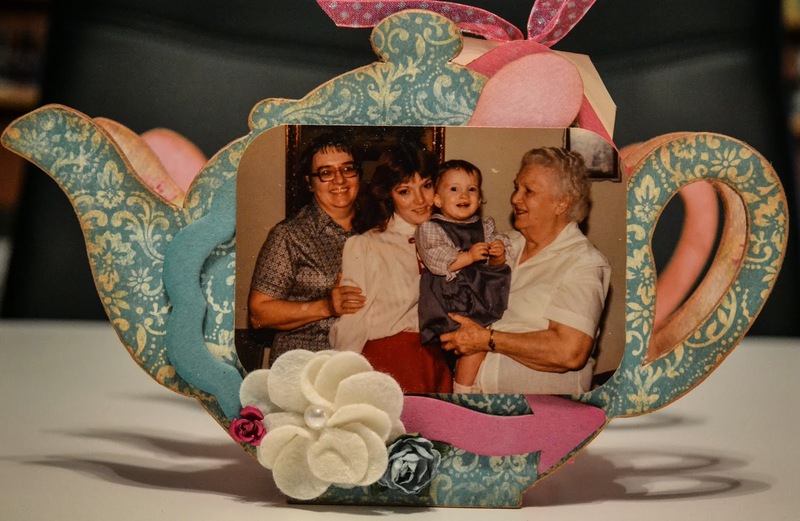 The button was one from my great grandmother's collection which seemed fitting with this particular project. And here is the backside! 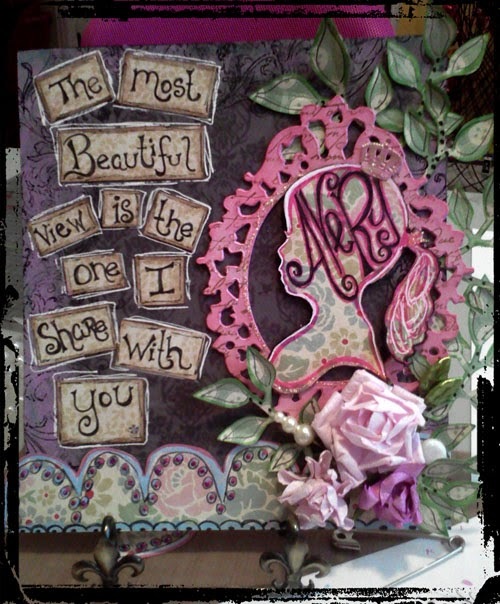 I used Wendy Vecchi embossing paste and a stencil here for the clock in the background. The envelope is also made of the Authentique paper. 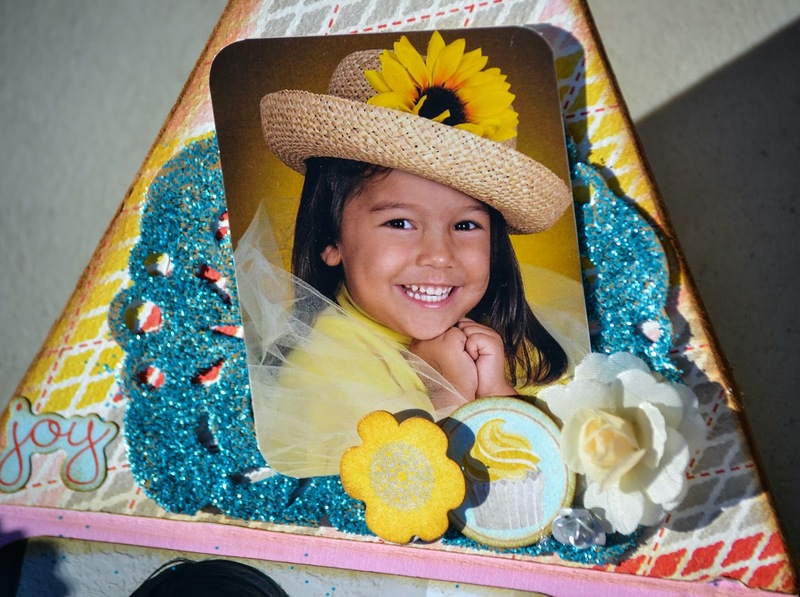 This project is on display as well as all the supplies you need! 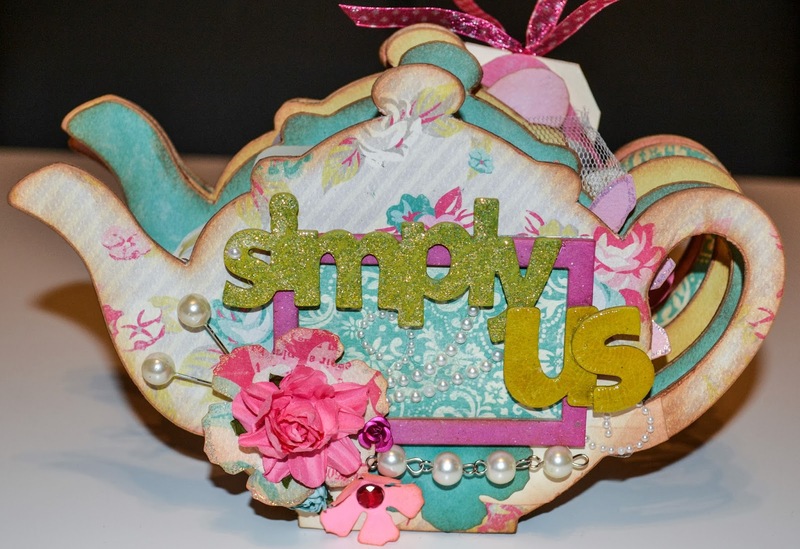 Hello, it's Tina here today to share with you another card creation using wonderful products from The Crafty Scrapper! I was so excited to see such pretty papers in my design team kit this month. I decided I needed to find the perfect design to really show them off. This easy to make starburst design does the trick! I also got to use some favorite dies from My Favorite Things. In my style of card making, I almost always add a sentiment to the front of the card. 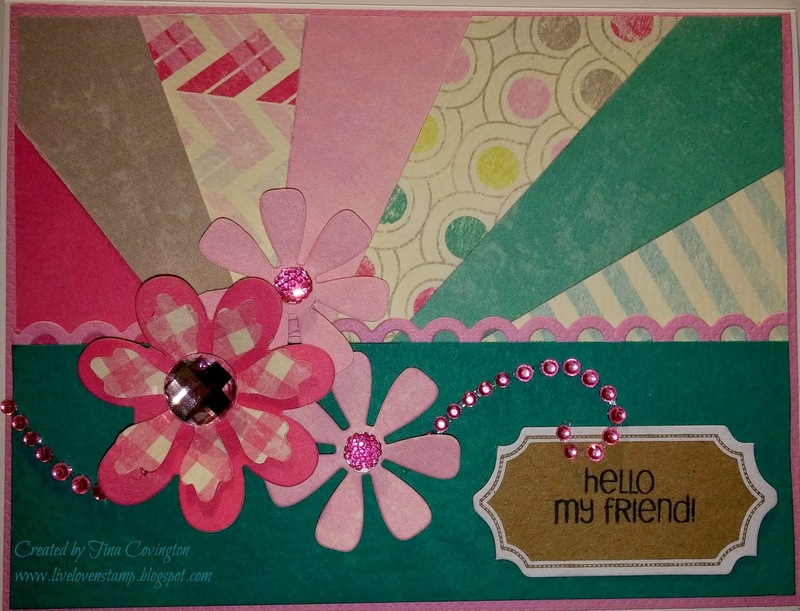 I liked the "hello friend" sentiment because that way this card could be for multiple occasions. I love how it came out. I hope you do too! 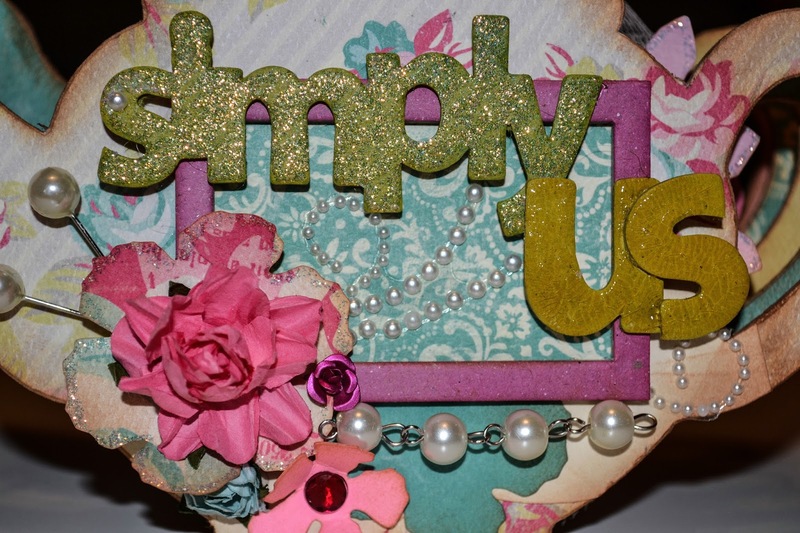 All the supplies can be found or ordered at The Crafty Scrapper! Hi everyone! 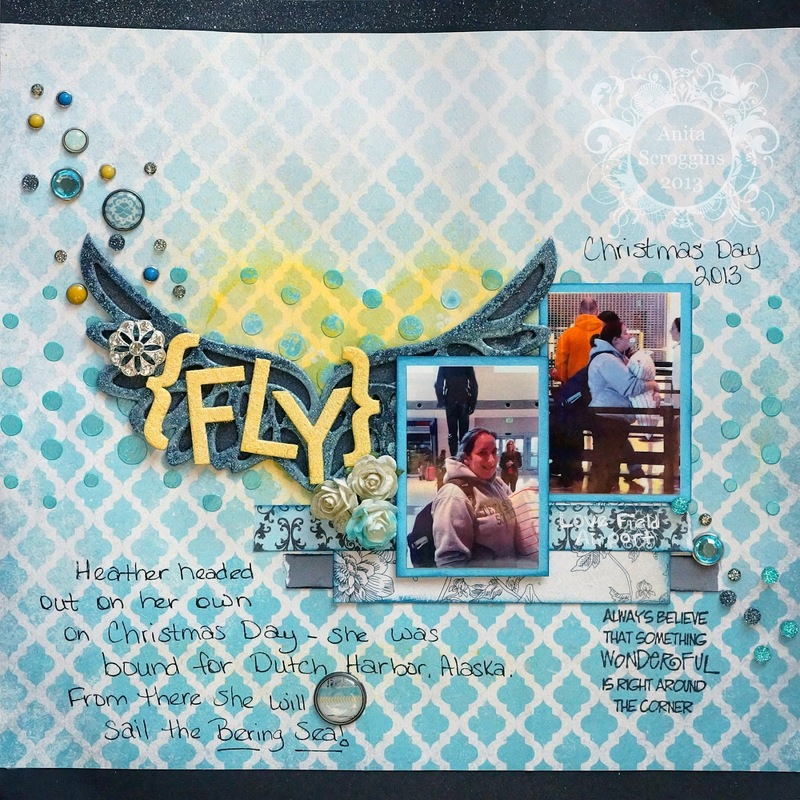 It's Patty here today, sharing a layout that I recently created for The Crafty Scrapper Design Team! 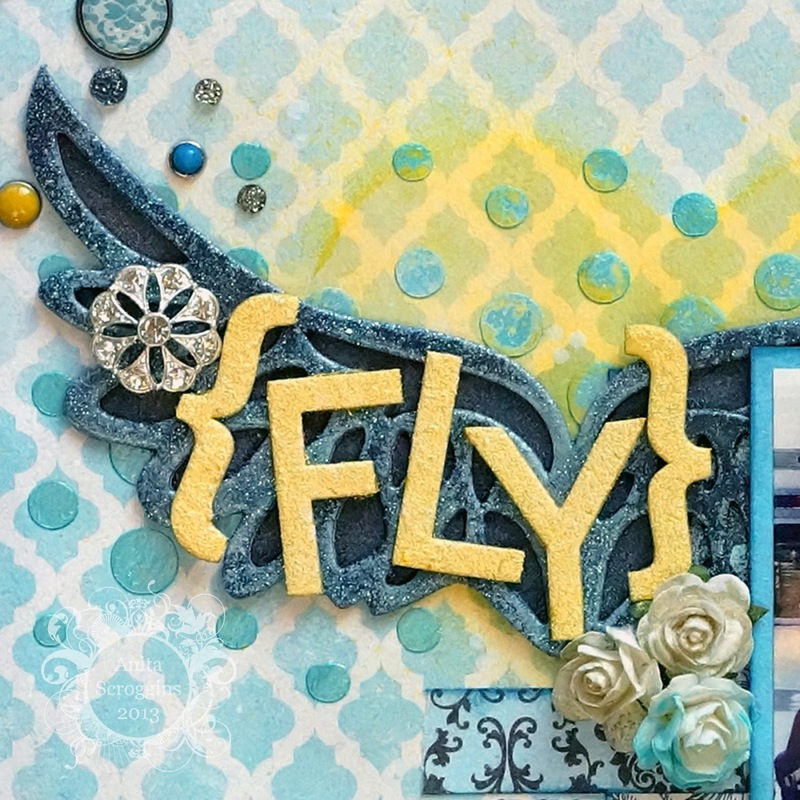 Papers and stickers used here were the Journey Collection by Authentique, Dylusions stencil, Maya Road Embellishments, Ranger Crackle Accents and Stampers Anonymous. This layout was fun and easy to make! 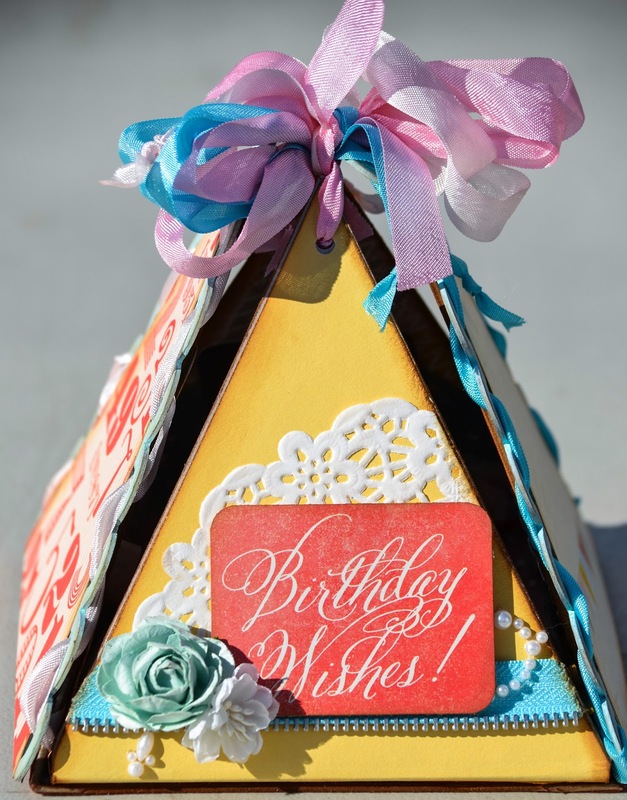 Some of the techniques used here are paper tearing, inking, layering and fanning the papers, stamping, masking and painting. The inspirational journaling here is done in calligraphy. Thanks for taking a peek at this layout. 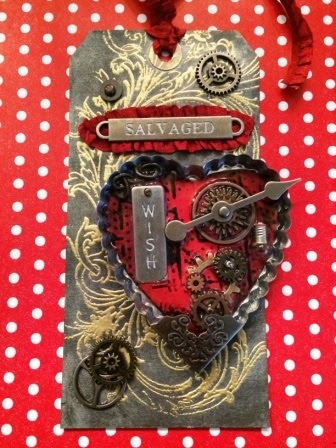 I hope to see you at The Crafty Scrapper! Hello! It is Ginger here today! 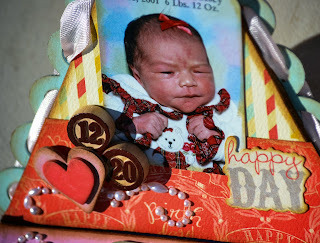 I did this layout for the Design Team at The Crafty Scrapper. This sweet photo is my oldest grandson Logan. He is now 13 and he was around 3 when this photo was taken. He is so cute wearing a golf shirt, hat, and carrying a golf club. I love, love these papers by Authentique Suave Collection. These papers looked old and it goes with the photo. I distressed around the second paper and curled up the corners. The second paper I cut it out and glued to the the pretty blue paper. I used by Martha Stewart Deco Fan punch and her circle cutter. I inked around the circle with Tim Holtz Distress Ink. I was given the little bird cage, key, and the scallop piece which is from Maya Roads. I painted each one blue and added Glossy Accents to the key and bird cage. I added these pretty flowers which I added a center to each one. I then rolled up strips of paper and glued them down. I was also given this cute little brown bow tie!! On this corner I added a pretty flower and a pretty center. I then rolled up more strips of paper and glued them down. 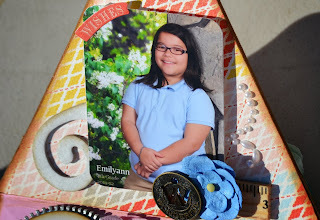 I was given this pretty black flower, bow tie, and by Maya Roads this pretty chipboard button which I painted, added glossy accents, and then thread. Here you can see the little wire tree which I added another bow tie and more of the rolled up strips of paper. 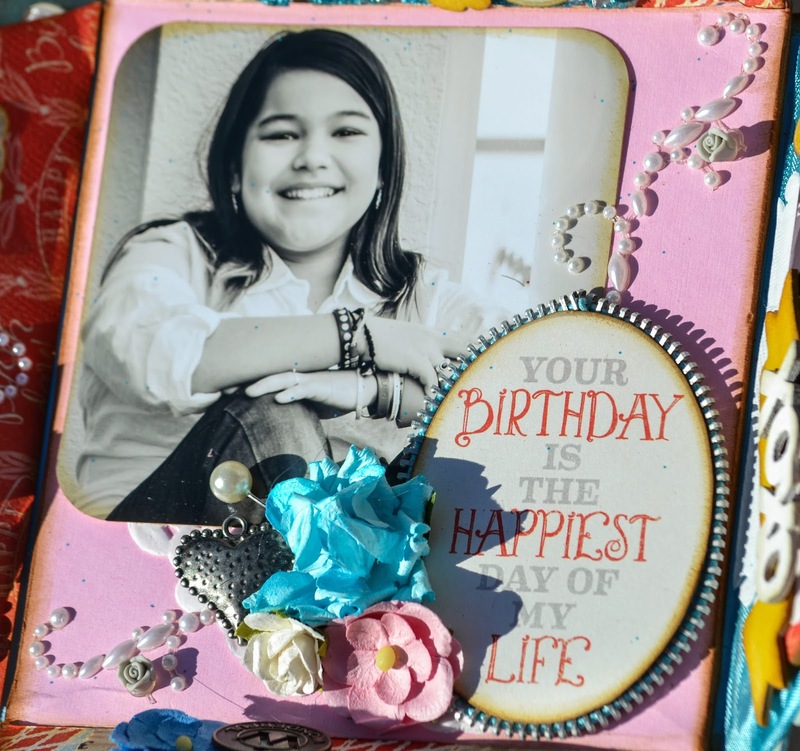 I was also given this cute banner by Maya Roads which I painted and added glossy accents. I found these letters and then used a fine tip black marker to go around each one. Shelley, here, with a layout using Simple Stories! 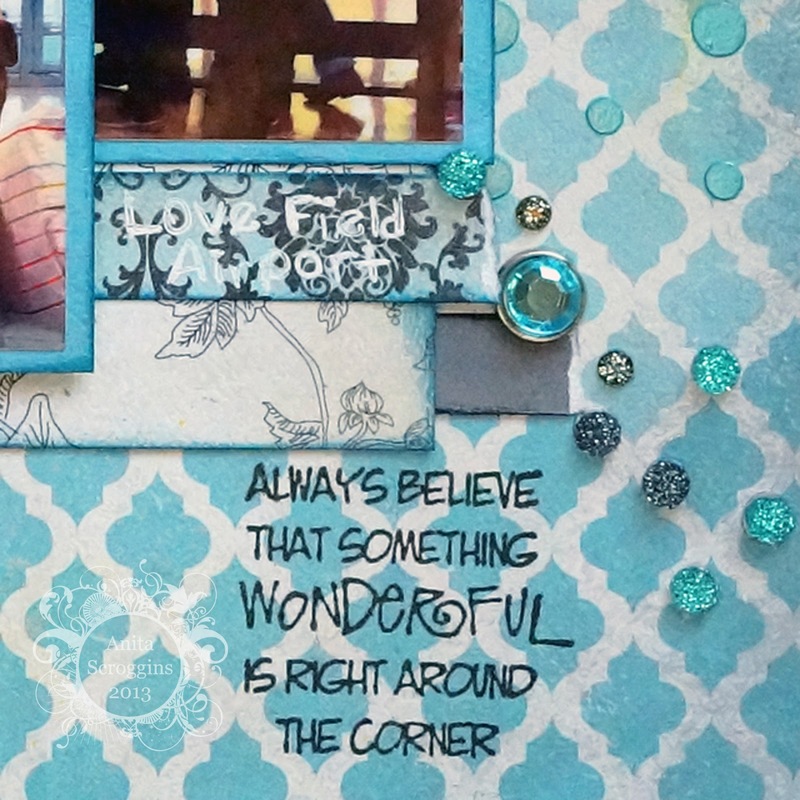 For this layout, I started out layering pieces from the Simple Stories "Homespun" collection. This was such a pretty and fun collection with lots of color! 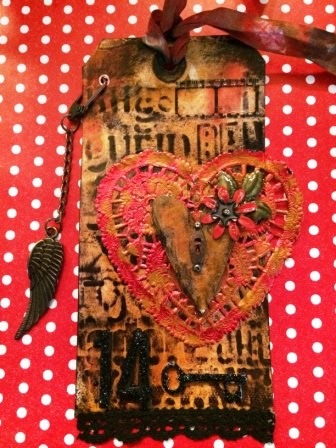 I used several chipboard pieces from Maya Road, and painted them with Tim Holtz's Distress Paint! They came out fabby! A few sentiments on this cool chalkboard label really set the picture off! This little tree paper clip was the most fun! 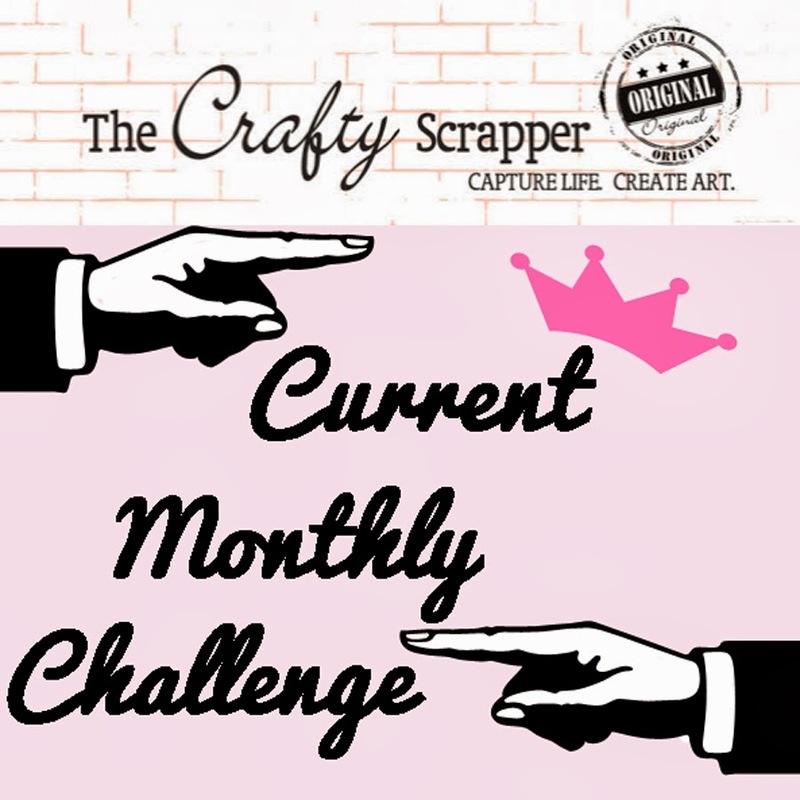 Stop back by The Crafty Scrapper Blog often for inspiration and entertainment! Better yet, come in to see us!!! and we would love to see it! 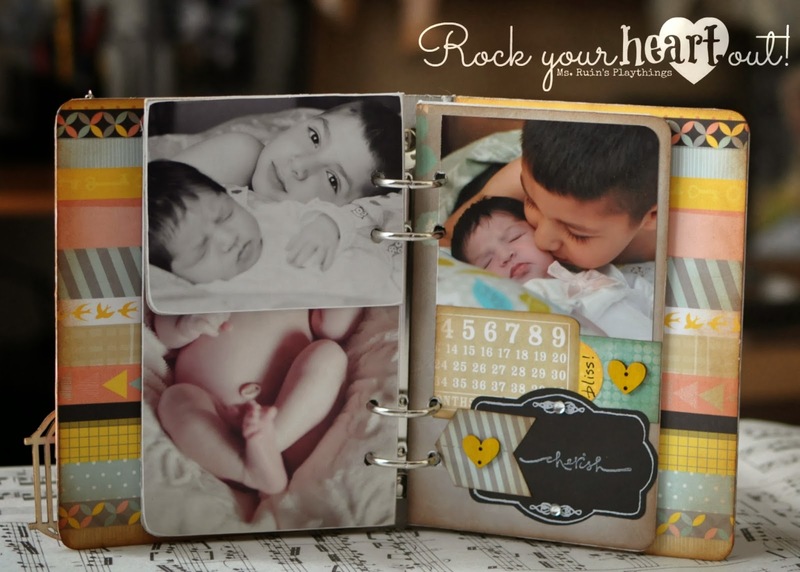 For this layout I have used new Authentique Papers Elegant. To create my mask, I used my Cameo and cut this pattern from scratch paper. 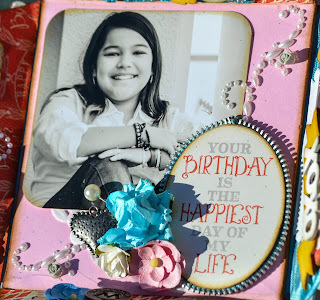 I used Wendi Vecchi's Embossing Paste, which I colored with Gelatos® to stencil the pattern on. embossing powders and glitters on them. I used Dylusions Lemon Peel for the heart, Maya Road alphas and rhinestone button. Brads and bling from October Afternoon, Queen and Co, Teresa Collins and others. and link up below by February 28th. One winner will receive 2 new masks from Ranger! !